Do you make mental errors in matches because you are choking? Is your mental game preventing your from taking risks? Learn how to overcome fear of failure and other mental roadblocks so you can perform to your potential. Do you agree with any of these statements? I compete tight or tentatively and can’t get out of my own way. I become frustrated with making stupid mistakes. My confidence goes up and down like a yo-yo depending on my performance. I become indecisive in matches and get frozen by indecision. I wish I could compete freely without excess tension or over thinking. Dr. Patrick Cohn is a master mental training expert at Peak Performance Sports. Dr. Cohn works with athletes and teams worldwide from a variety of sport backgrounds including wrestlers and coaches. As the president and founder of Peak Performance Sports (Orlando, Florida), Dr. Patrick J. Cohn is dedicated to instilling confidence and composure, and teaching effective mental game skills to help wrestlers and teams perform at maximum levels. In addition to working with wrestlers and teams, Dr. Cohn teaches parents, coaches, and athletic trainers how to help wrestlers achieve peak performance through mental game skills. If you are under performing at match time, you’ll want to take a close look at your mental game. Most athletes will go back into the gym and just do more reps, but that’s not the answer. Do you want to get expert mental coaching from the comfort of your home from anywhere in the world? You can join a mental toughness program via Skype, phone, FaceTime, or GoTo Meeting from anywhere in the world. Today’s video technology allows you to connect with Dr. Cohn, experienced mental game professionals. Consistently take your practice into every match. Use prematch routines to raise the consistency level of your performance. Learn mental strategies to have laser focus and overcome distractions. 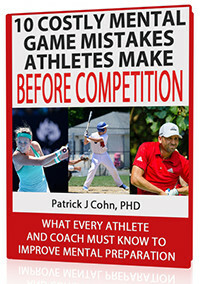 You can improve your mental game with Mental Game Coaches, Dr. Patrick Cohn. You can opt for one-on-one sessions with Dr. Cohn in Orlando, Florida, or you can stay where you are and do sessions from anywhere in the world via telephone, Skype, or video-conferencing—also with Dr. Cohn, personally.